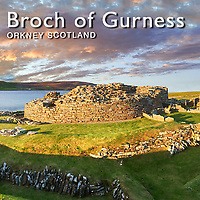 Images, pictures & photos of the Broch of Gurness iron age settlement, Orkney, Scotland. The Broch of Gurness is a rare example of a well preserved iron age Broch village. Dating from 500 to 200BC the central round tower probably reached 10 meters (30ft). This was surrounded by thatched roofed houses. The settlement was surrounded by walls and two deep ditches. Gurness was probably the most important settlement on Orkney 2000 years ago. The centre of the Broch is about 45 meters in diameter. The central round tower had double skinned dry stone walls and two storeys inside. This would have been occupied by the clan leader and his family. The roof of the tower would have been thatched and has a walkway around it. There were 2 hearths in the brooch and an underground stone cistern for fresh water. A set of steps lead down into the cistern and it is believed that these may have allowed the occupants access to the subterranean cistern for religious reasons pertaining to an iron age cult of the underworld. Surrounding the central tower of the Broch were thatched dwellings which were surrounded by a fortified wall. This type of Broch village is unique to the Isles of Orkney and the Broch of Gurness is the best preserved in Scotland.